IT HAS BEEN DECIDED! Ursus just made too many excellent points in his extremly detailed argument, so I have decided to go with Torchic. Thank you all for your input. I now declare this today's Random Pokemon Topic. 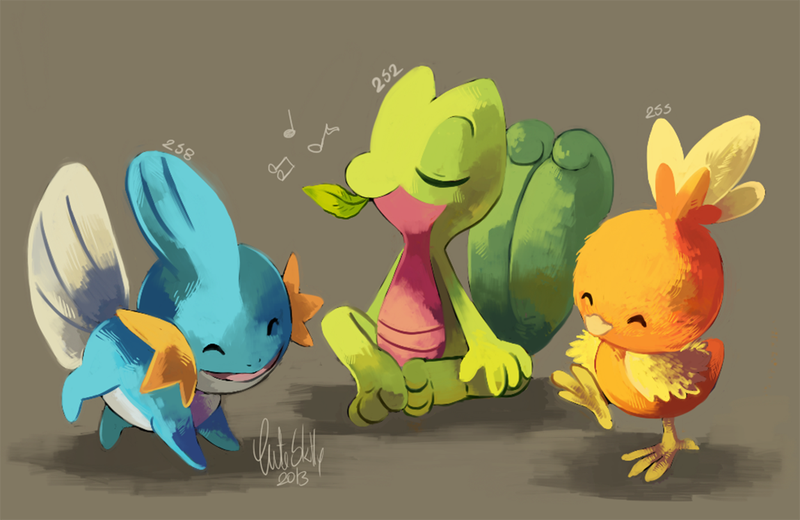 Treecko or Mudkip? I JUST CAN'T DECIDE WHICH! Except for generation 5, I've always chosen the fire type starter in every new Pokemon game. Except for remakes. In remakes I pick one of the other starters. Heart Gold I decided to pick Chikorita. Fire Red .... well .... ok, I picked Charmander again, because Charmander and his line (despite the fact that they shouldn't survive in the wild) are the best Pokemon ever and YOU CAN'T TELL ME OTHERWISE! Ahem, anyway poll time. You people decide. I would put an actual poll here, but apparently embedding them doesn't work anymore. If I paste the code to the preview view it confuses tags for text and if I paste it in the HTML view it just gives me a link, so whatever.